The ‘World War One- Playing the Game’ website supported by the Heritage Lottery Fund draws together real stories from across Westminster, Kensington and Chelsea, and Hammersmith and Fulham. Using Michael Foreman’s award winning book ‘War Game’ as inspiration we tell the story of the First World War using archive material. The fictional story is put into context by introducing real soldier’s stories and the wider history of World War One. 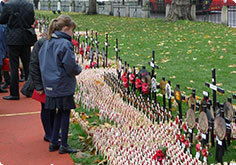 The website is part of a larger schools project that Westminster City Archives put together to remember 100 years since World War One (1914-1918). The project aims to highlight the connection between football and World War One, using author and illustrator Michael Foreman’s book ‘War Game’ as inspiration. ‘War Game’ tells the true story of the Christmas Truce and the famous football matches between the trenches. Many other local stories are also told, including the story of ANZAC and the William Morris “Billy” Hughes, who went to Burdett Coutts Primary School in Westminster and later went onto become the Prime Minister of Australia. The website is especially suitable for schools who are studying WW1 as there are plenty of good education resources for further study. The website has been put together by staff and volunteers at the City of Westminster Archives and is funded by the Heritage Lottery Fund. On this website you will find lots of information, educational resources, a documentary, video game and animated film. You can also contribute by registering and submitting your own stories. We hope you enjoy the site and please get in touch if you have any questions or comments.